County Executive Joanie Mahoney delivers her budget address to lawmakers as Chairman Ryan McMahon looks on. Behind Mahoney is county attorney Bob Durr. 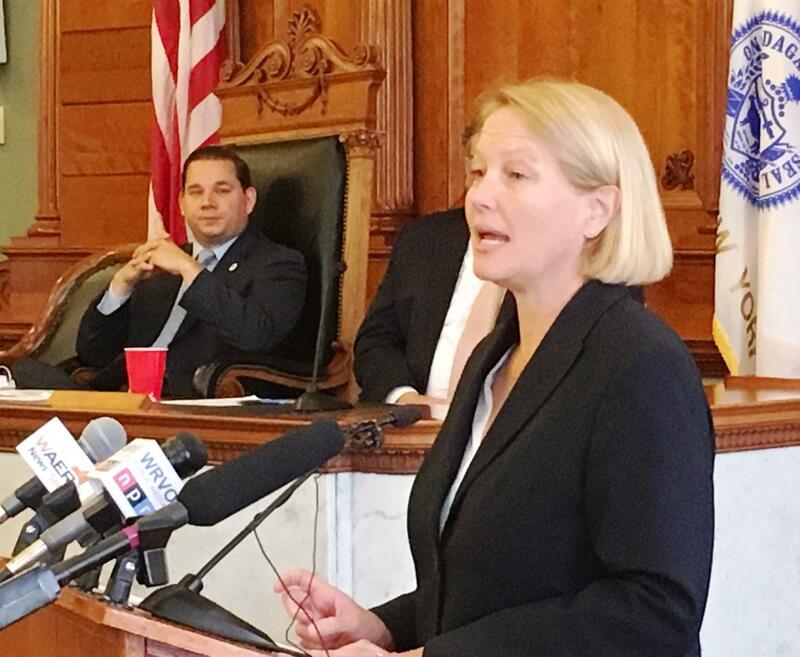 Onondaga County Executive Joanie Mahoney presented her budget proposal to lawmakers Thursday, which includes no property tax increase for 2017. The $1.3 billion spending plan represents a 1.9 percent increase over 2016. But there are signs that the budget is a bit more strained than in recent years. While the property tax levy stays flat, Mahoney says they’re also predicting a modest increase in sales tax revenue that’s roughly half of what it has been. "At the same time that we're enjoying historically low property taxes and a leveling off of sales tax, we're also seeing increases costs for personnel, and a significant increase in what we're paying for the cost of our health care," Mahoney said. "That combination makes this budget a little more difficult than others recently, but we've seen tough budgets before, and we've come out stronger." In her budget, Mahoney also proposes a merger of the county’s Metropolitan Water Board with the Onondaga County Water Authority, which is not part of county government. She says the long-discussed plan should eliminate redundancies in the supply chain that, in time, should reduce water bills and create substantial savings for the county. Hear the story from WAER's Scott Willis. 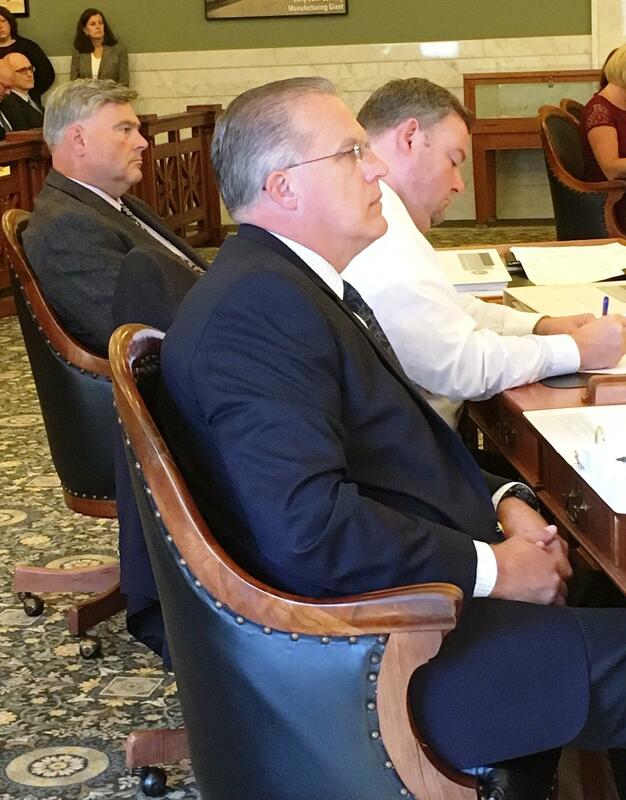 Left to right, Legislature Ways and Means Chair David Knapp, Tim Burtis, and Derek Sheperd listen to Mahoney's budget address. County legislature chair Ryan McMahon feels his fellow legislators will be supportive. "I think it's very refreshing that the county executive's proposed this," McMahon said. "OCWA is in a better position to make long-term infrastructure improvements than we are. At the same time, OCWA would take our employees on. There will be personnel savings on their side of the ledger. When the big infrastructure improvements come along in the future, they're going to be able to absorb much of that without having to pass on rate increases. So, it makes a lot of sense." Mahoney says her budget also anticipates $8 million of savings through a voluntary early retirement plan. She says at least 150 employees would need to take the offer. 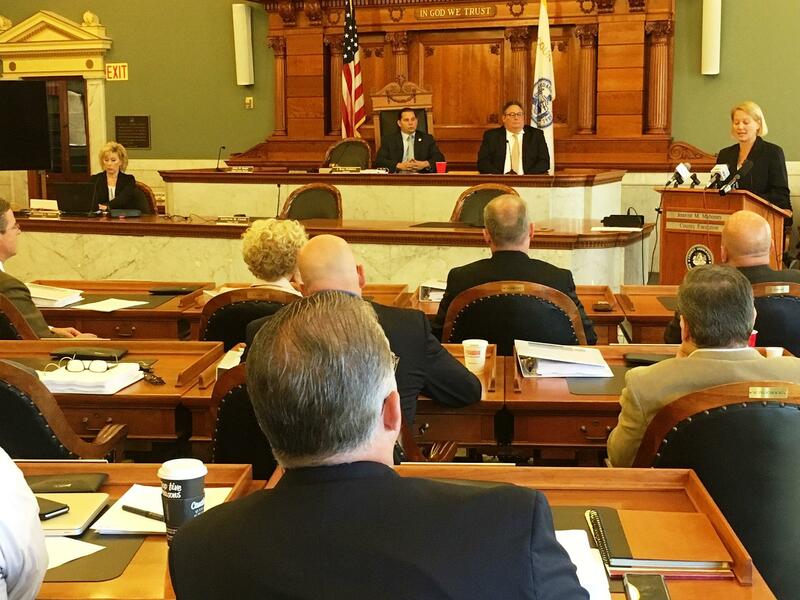 Onondaga county lawmakers will now spend the next few weeks reviewing the budget, and making changes in time for a vote on October 11th.